The original Walkman had two headphone jacks. (@OReillyMedia reminds us – and if you look closely, you can spot them!) Couples sharing iPod earbuds was an early sign of communal listening. So, how did the portable player turn listening inward – and how can you turn it back in the connected, Web age? Industry titans Google, Amazon, and now Apple have each launched “cloud” music services. Yet, despite being connected via the Internet by design, these services are primarily concerned with solo listening. Even with Google’s various social efforts (+1 and the like), or Apple’s fledgling if not-exactly-blockbuster service Ping, there’s little to suggest that sharing with friends online was even a consideration. All of this raises the question: what should listening look like now that we’re connecting to music through the Internet, instead of through the headphone jack of our Walkman? Against that background, writer Primus Luta (David Dodson) offers a guest editorial on the potential of social music and new means of listening. I’d like to start this off with a proposal. 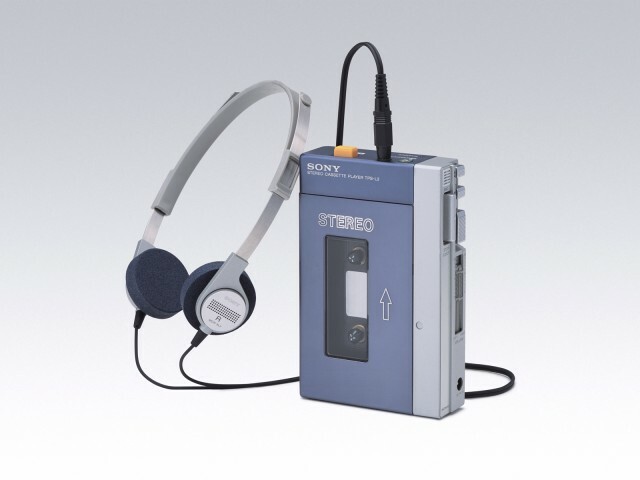 Despite the incredible innovations that have developed in music in the past few decades, none can match the impact of the one pictured above: the Sony Walkman. To understand my rationale, separate the music from the business. Though the Walkman had a clear impact on the music industry, what it did for the listener’s experience was the seed for most of the innovations that followed. When I was growing up, the whole idea of personal listening was limited to one’s ability to find a closed room with a stereo system. When you played something, everyone within earshot heard it, be it my mom rocking Olatunji while she cleaned house, my sister bumping David Bowie, or my aunt throwing back to Etta James. I did have a small radio I used to listen to Casey Kasem count down the top 40 in my room, but for the most part, when someone listened to music, everyone did. Outside, boom boxes reigned supreme: you’d hear what someone was blasting as they walked down the block then hit the record store to track it down. Then came the Walkman, which allowed for private music listening in any environment. There were a lot of benefits to this, not the least of which was my mom not having to hear the 2 Live Crew I was nodding my head to (or even knowing I was listening to it, shhhhh). Over the years, however, this privatization of music listening has led to a decrease in spaces for social listening or even recognizing that listening to music is a social experience. This piece began with a simple tweet from CDM editor Peter Kirn, in which he made a tongue in cheek reference to music being his favorite anti-social experience. The comment stuck out for me because I’d recently been using two services which sought to restore the meaning of social listening. Both services move away from the networking aspect of the social movement, assuming you already have the network of friends you’d like to listen to music with, and jumping straight into the practical by providing a virtual space where you and those friends can listen to music together. “As a teenager,” Abe Fettig, the developer behind The Listening Room shares, ”it seemed like any time I was with friends, shooting baskets, playing videogames or riding around in someone’s car, there was music playing. So even though I listened to commercial radio a lot back then, I think most of the music I fell in love with came to me via having a friend who owned the album play it for me. Similar thoughts were at play in Denmark, as Esben Milan, one of the developers behind MuMu Player, explains: “I thought about making a live whiteboard where creative people could meet in a online space and draw, write and create projects together. My good friend had a similar idea for an office player where everybody in the office could control the physical speakers.” From this, MuMu Player was born. While there are parallels between the two services, the executions and experiences do differ. With MuMu Player, a central playlist layout manages social interaction. ”Everybody in the player can upload music and re-arrange the playlist – and the music plays in sync. That’s it. It’s the virtual way of when friends listen to music together in real life.” MuMu Player’s simplicity makes it quite intuitive. The shared playlist shows everyone’s uploads in the order in which they will be played and a side bar area is set aside for chatting while the music plays. One of the biggest differences between the two services is that MuMu is limited to five listeners per room. There are advantages to this, especially when managing the playlist and following conversations in the chat window. Overall, it makes the experience feel very intimate. The Listening Room abandons the centralized playlist and has no user limit, but because of that, operates a little differently. “Any registered user can create a room and add songs. When a song plays everyone in the room hears it, and sees the record spinning with album art. Any user — even those who haven’t registered — can drop in on a room to listen and chat. 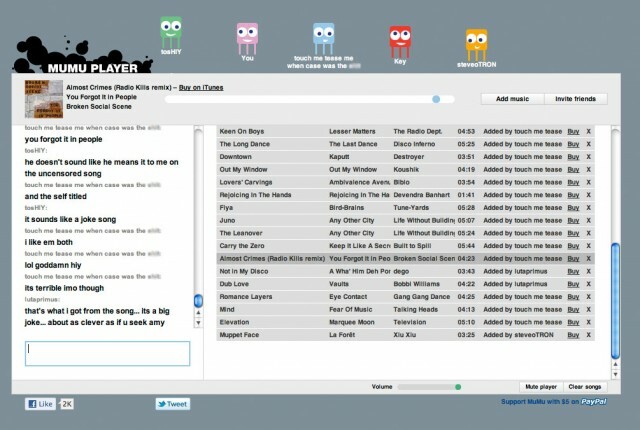 The chat is in sync with the music, so as you scroll down the page you can see what people said next to what was playing at the time.” What plays isn’t as immediately intuitive as with MuMu. The shared playlist is replaced with a personal queue of songs which only you can see and rearrange. When multiple users have songs in their queue, the room will alternate between user queues to pull selections. As there are no user limits on an individual room, it takes away the hassle of having to worry about playlist management, though without being able to see what someone has in their queue until it plays it makes the song selection a little less interactive. Ultimately, though, the thing that makes both services is the ability to converse about music in real time. Not only can you play your friend that song, you can key them in on a specific part of it. Discover the six degrees that separate your interest in shoegaze from your friend’s death metal collection. And how are you supposed to know what minimal witch house is until someone you trust plays it for you? I wish I could end this piece right here: try them both and see what works for you. Either way, you’ll surely discover the joy true social listening inspires. Unfortunately, though, both of these involve a hot topic of discussion in the IP world — streaming rights. Both services do everything they can to adhere the rules as they exist today, but there’s reason for concern. So far, there have been no legal actions against the services, but considering they are breaking into a new realm of streaming service, how that will hold up is uncertain. That both are aware of the issues bodes for their ability to adjust should things change. In a more connected world, we begin to understand more profoundly the life we share on a planet that is both fragile and potentially destructive. I remember the sobering feeling of listening to radio reports from Haiti during NAMM last year. There are countless calls for support for Japan, and I hope that, as in any disaster, people do learn more about disaster response worldwide, since any one of us can wind up as its recipient. But without covering every single one of those calls for aid, CDM contributor Primus Luta brings one wonderful musical compilation you may want to enjoy for some time to come. -Ed. A week ago today a 9.0-magnitude earthquake shook northern Japan, leaving much of the area in utter devastation. For the past week, all eyes have been on the island nation, most prominently due to the affects the quake has had on nuclear reactors in the area. Only one day before the quake, Laurent Fintoni made his annual trip to the place he calls his spiritual home. Laurent is the man behind the Rhythm Incursions site, Original Cultures project and a host of other things in and around the world of modern electronic music. In the immediate aftermath of the quake, he housed up with Rhythm Incursions co-presenters Raid System and started work on a compilation to be released to support the relief efforts. Today, exactly one week after the quake, that compilation Nihon Kizuna has been released with a stellar lineup of over 40 artists including Kode 9, Kuedo, Rudi Zygadlo, Daisuke Tanabe, Paul White, Mux Mool, Ernest Gonzales, Onra and many more. You can listen to a short mix of the music included in the compilation below or just go straight to the Nihon Kizuna site and purchase the compilation. Updated: TRUE CHIP TILL DEATH has a chip music compilation going, too. I know there are many others, so feel free to add them in comments.